Google Pixel Slate hands-on review: Are we looking at an iPad Pro killer? hands on review | What Hi-Fi? Are we looking at an iPad Pro killer? Can it compete with the iPad Air? Google unveiled a smattering of new products at its recent launch event, one of which was a new Chrome OS tablet named the Pixel Slate. Is it good enough to worry the supremely talented Apple iPad Pro? We shall see. If Google was aiming for a premium look and feel for its new Chrome OS tablet, first impressions are it's job done. Thanks to the Gorilla Glass front, which covers 80% of the tablet’s surface, there’s decent weight to the device, while the aluminium chassis (which is just 7mm thick) also feels reassuring solid. The smooth, curved edges mean the Slate sits and feels nice in your hands too. The new Midnight Blue finish looks smart - Google wanted something different from the finishes available for its Pixel phones, so this is the only option available at launch. The Google Pixel Slate uses a brand new 12.3in “Molecular Display” display with 3000 x 2000 resolution and 400 nits of brightness. With 293ppi in its locker, Google is claiming the Pixel Slate has the sharpest picture in its class. The tablet has been designed for low power consumption - Google claims a charge should last around 10 hours, which puts it in the same ball park as Apple’s iPad Pros. It incorporates fast charge too, so you should be able to get around two hours of use from 15 minutes plugged in. Google’s positioned a pair of 2W front-firing speakers on the front of the Slate - when it’s held in landscape they’re positioned at either end. It also uses what Google calls Custom EQ, a preset audio mode which has allegedly been tuned by one of the world’s leading sound engineers (although Google won’t say who). It’s supposed to promote crisp highs and deep lows. Both the front and back of the Slate get 8MP cameras - a wide angle lens is provided for video chat and improved low light performance. Google’s all-new Chrome OS operating system is designed to deliver a handheld Chrome experience presented in more of a desktop package. Swipe up from the bottom edge and you'll see Google Suggestions - it’s intelligent enough to suggest apps that you might be looking for as soon as you swipe up to engage it. There’s a fingerprint sensor built into the power button on the edge of the Slate. At the launch event there were a couple of occasions where users struggled to get it acknowledge their tapping, so it’ll be interesting to see just how intuitive it is over a longer period of time. To help bridge that gap between tablet and desktop, Google has also announced a partnering accessory, the Pixel Slate Keyboard. It’s a £189 option and is similar in form and function to the iPad Pro’s Smart Keyboard, but with round ‘hush’ buttons instead of "clicky" squares. 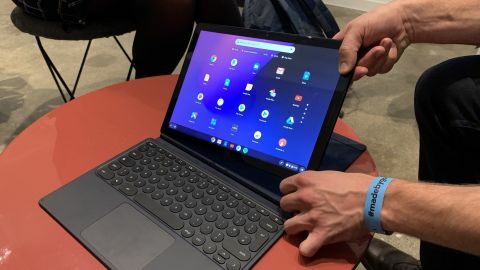 The Pixel Slate Keyboard is backlit and full-size - Google claims studies have shown that compared to squares, the round buttons used on its keyboard result in less user fatigue and are actually easier to use. The keyboard can also be manipulated so you can rest the Pixel Slate at various angles for when you want to type or just watch video. You can engage a feature called Night Light where the Slate switches from harsh blue light to warmer tones so it doesn’t over-stimulate your eyes. Think of it as Google's equivalent of Apple Night Shift. The Google Pixel Slate comes in not one, but four different flavours, with each one using a different processor, varying amounts of RAM and hard drive capacity. Prices start at around £549 for an entry-level version of the Slate with a Intel Celeron Processor, 4GB RAM and 32GB storage and tops out a around £1549 if you opt for Intel’s eigth-gen i7 Processor, 16GB RAM and 256GB of storage. We were shown a few seconds of a high quality YouTube video which depicted an island scene with cloudy blue skies tropical forest and a huge expanse of water. The picture appeared to show a decent level of brightness and detail without looking overegged. Of course, we’d need to spend a bit more time with the Slate trying out various streaming apps to present you with the bigger picture, but Google seems to have gone down the right track. During the press event we had a very quick demo of Cher Blue’s R&B track, Feeling Wavy, played through Spotify and the Slate’s internal speakers. To its credit, the track seemed to sound relatively clear and crisp. It wasn’t drowned out by the ambient noise in the room, but at the same time you didn’t seem to get much of an impression of bass. We need more time with it in our test rooms to deliver a more definitive verdict. We did note that your hands might get in the way of the stereo speakers if you watch something in portrait. Your hands are naturally drawn to that position, but it wouldn’t take much to rearrange your grip. The Google Pixel Slate doesn’t come with headphones, but does support Bluetooth pairs or wired models that use a USB-C connector. The fact you can customise the spec of your Pixel Slate will be a big plus factor for some. This sort of flexibility combined with its very decent specification should make for an interesting proposition. Be sure to check back for the official What Hi-Fi? verdict.